Last night I went to City Kitchen, again, with my favorite yoga buddy, and friend, Alycia. It is located at Row NYC – 700 8th Ave at 44th Street, NYC. This time I tried out Ilili Box finally. They make Mediterranean inspired food. 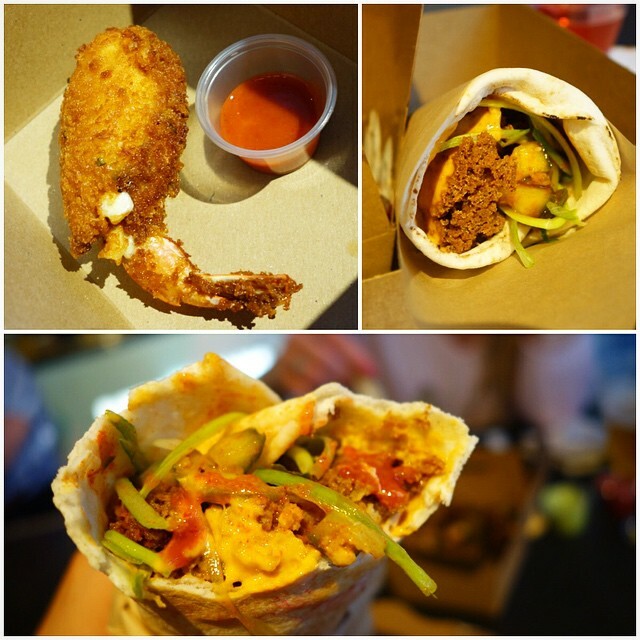 We also tried out some stuff from Gabriella’s Taqueria. 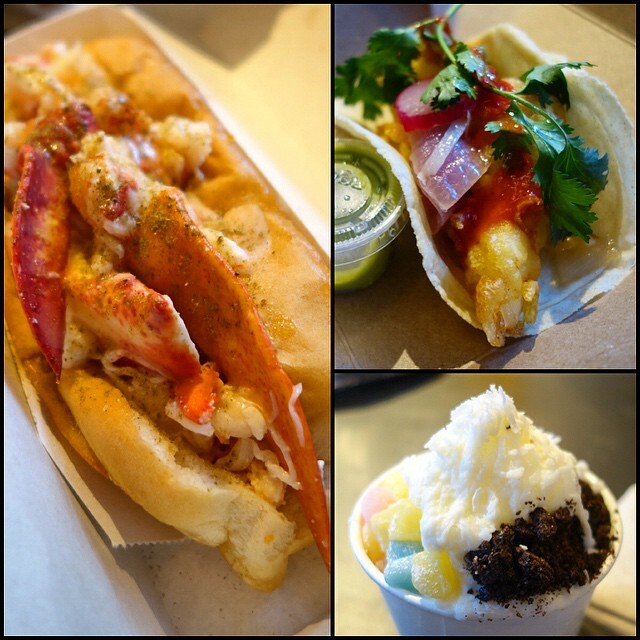 I recently tried a breakfast taco from here so I’ll throw that in this post, as well as a lobster roll from Luke’s Lobster, a shaved ice from Wooly’s and a few doughnuts from Dough. From Ilili I had the Korean falafel. The fried falafel comes neatly wrapped up in a tortilla style pita wrap, not a traditional thicker, round pita. It is much less messy than the traditional falafel sandwiches that I am used to, where everything falls out as you eat it. Since the place makes Mediterranean inspired food, and this one has a Korean fusion to it, it is filled with cucumber kimchee, Korean tahini, scallion and basil. I wanted to save Luis half of it because he wasn’t with me and I really wanted him to try it, but I could barely even save him a bite to bring home with he haha. The flavor in this is very complex. I LOVED it. Also, it is vegetarian AND vegan, FTW of course. We also tried the shrimp relleno from Gabriella’s Taqueria. I’ve had relleno in the past, but not like this. It was absolutely delicious. It was a poblano pepper, filled with shrimp and chihuahua cheese, then coated in breadcrumbs and fried. It was served with a dipping sauce, which I combined with the hot sauce. So good. 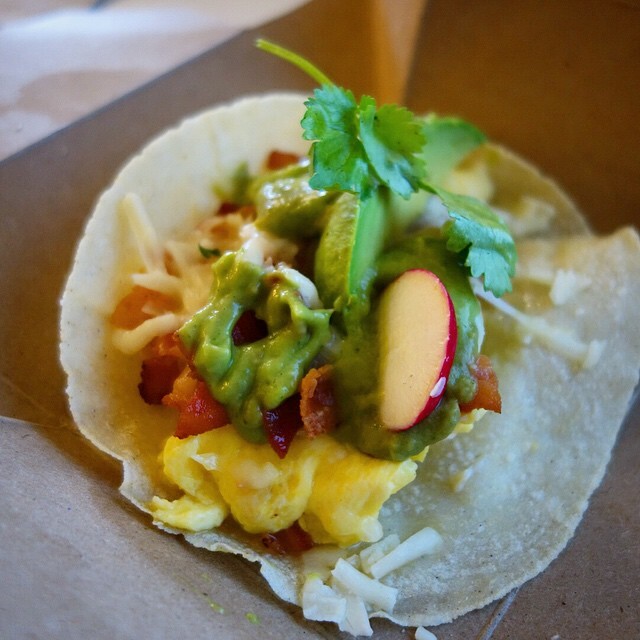 I have also had a fish taco from Gabriella’s, as well as a breakfast taco! The fish taco from Gabriella’s Taqueria is just listed as from the local fish market, so I am not sure what type it is. But it is just lightly fried, then topped with pickled veg, radish slices, cilantro, roasted tomato salsa and served with a little container of tomatillo-avocado sauce. Since the season is changing I realllly wanted a lobster roll. This weather just makes me want them. Must be why national lobster day is right around now 🙂 I stopped by Luke’s, which normally I love so much, and have had too many times haha, but for some reason I was a little underwhelmed by the one I got at the city kitchen spot. It is also disappointing that they don’t offer The Ark here, like their other locations (half of each – shrimp, crab, lobster and a bag of chips and a soda). That is my favorite deal of theirs. The one I received there seemed a little less full, and lacked a little luster in my opinion, compared to the ones I am used to from them, that is, which are amazing. My friend/coworker Andrea said one of her all time favorite things is shaved Ice/snow. So I decided to give Wooly’s a shot. I’ve never had it before so the guy at the counter suggested I go with the Original Leche flavor. I went with that, topped it with coconut flakes, cookies and cream, aka Oreos and a sea salt leche drizzle. It was very good, but next time I want to try more of a flavored one, like matcha green tea! City Kitchen opens at 630AM, which is a blessing and a curse, since Gabriella’s makes breakfast tacos, and, well, Dough. All of the breakfast tacos are made with fresh corn tortillas, filled with scrambled eggs, home fries, and choice of steak, sausage, smoked ham or bacon. I chose bacon of course. They are garnished with sliced avocado, cilantro and green tomatillo-avocado sauce. It was delicious, my only advise is to eat it there, don’t take it to go. I did and it got cold, obviously. Would’ve enjoyed it more there, but had to run to work. And then there was Dough. Oh, Dough. 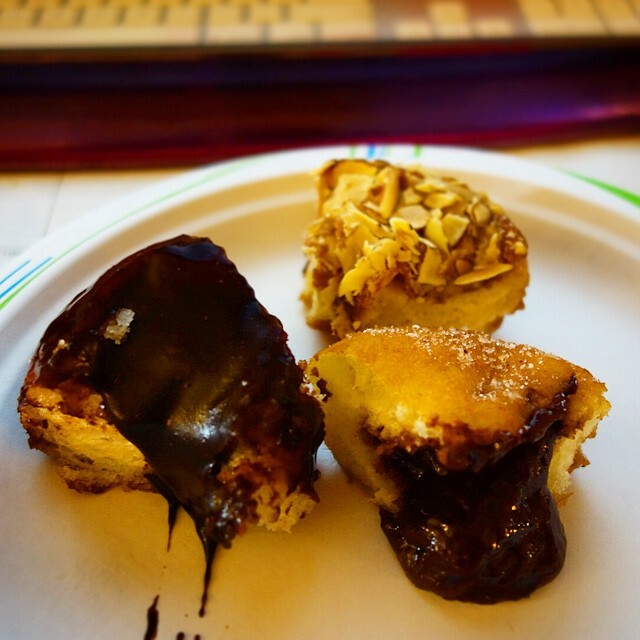 I picked up 3 doughnuts, nooooo not for just me, I split them with a few people at work. Dulce de leche, which is a doughnut covered in dulce de leche and crispy almond slivers, chocolate salted caramel, which is belgium dark chocolate infused with french caramel and sprinkled with mediterranean sea salt, and last but def not least, actually my favorite one – plain sugar doughnut filled with nutelllllaaaaaa. NOM. Dangerous. This place is so convenient to port authority, which I travel to and from everyday. I don’t know if this is a good or bad thing haha, but I’m already a regular. They are open from 630AM – 9PM weekdays and until 11PM weekends. Oh yea, btw, they have happy hour at a couple of places here, definitely Ilili. $5 beers and $6 cups of wine until 8PM. Awesome.